Designed to work as both a study guide and reference tool, this MSCE exam guide covers the exam in detail using step-by-step activities, illustrations, and assessment questions. Dummies Test Engine, QuickLearn ? The fun and easy way ? to study for the exam - all the rewards in half the time! Here's the MCSE Windows ? 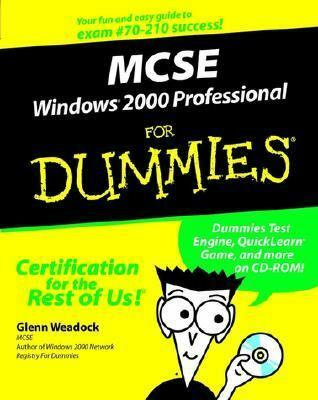 2000 Professional test-prep guide you've been waiting for - a For Dummies ? all this on the bonus CD-ROM Dummies Test Engine, our exclusive, fully customizable test-prep software featuring hundreds of sample questions QuickLearn ? an exclusive sci-fi adventure game that builds test-taking skills Plus an MCSE screensaver and bonus demos from Specialized Solutions and Super Software PC running Windows ?